Jorullo, a volcano of Mexico, in the state of Michoacan, 160 m. W. by S. of the city of Mexico. It rises from the plain of Mal-pais, which forms a part of a plaform having a mean elevation of 2,500 ft. above the sea, and is on a line with a chain of volcanoes including Tuxtla, Orizaba, and Popocatapetl to the east, and Colima to the west. From the discovery of America down to the middle of the 18th century no volcanic disturbance had occurred in this region; and the present site of Jorullo, about 100 m. from the nearest sea, was the centre of a series of sugar and indigo fields, drained by two small streams, the Cuitimba and the San Pedro. In June, 1759, strange hollow sounds were audible, and earthquakes succeeded each other until the end of September, when flames issued from the ground, and rocks were thrown to a prodigious height. On the line of a chasm running from N. N. E. to S. S. W. were formed six volcanic cones composed of scoriae and fragmentary lava, the smallest of which attained 300 ft. in height, while Jorullo, the central volcano, rose to an elevation of 1,600 ft. above the level of the plain, and launched forth streams of basaltic lava with included fragments of granitic rocks, which ejection did not cease until February, 1760. The natives, on returning to the spot many years after the outburst, found the ground still uninhabitable from the excessive heat. Around the base of the newly formed cones, and radiating from them as from a centre, over an area of 4 sq. m., is a convex mass of matter some 550 ft. high at its junction with the cones, and gradually sloping thence in all directions toward the plain; and on this convex protuberance, sloping at an angle of about 6°, are thousands of low conical mounds, called hornitos, ranging from 6 to 9 ft. in height, from which, as well as from extensive fissures across the plain, issued clouds of sulphurous acid and aqueous vapor. 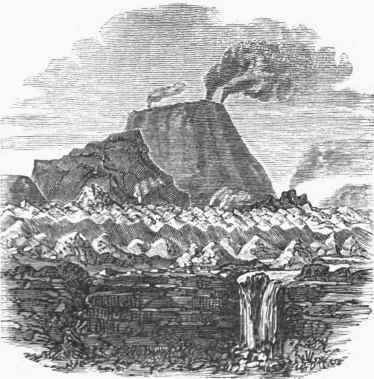 In 1827 they had entirely ceased to emit steam, and the mountain has not since shown any signs of activity; vegetation had made marked progress on the flanks of the new hills; and cultivation had been resumed on the fertile plain surrounding the volcanic centre. The great distance of Jorullo from the ocean is observed by Lyell as an important circumstance, showing that proximity to the sea, though a common characteristic, is not an essential condition of the site of active volcanoes. The two streams above mentioned disappeared at the time of the eruption below the eastern extremity of the plain, and afterward reappeared as hot springs at its western limit.